China SFECO group, a subsidiary of Shanghai Construction Group Co. Ltd., held a ground breaking ceremony in Eritrea to undertake different agriculture related plants worth US$ 100 million. The massive Engineering, Procurement and Construction project will constitute the construction of three cold food storages in three different sites; an aluminum can manufacturing plant, and a high quality PVC agriculture drip irrigation pipe production line. The Eritrean Ministry of Agriculture owns the projects after securing a 630 million Yuan preferential loan from the Chinese government. The increasingly assertive SFECO group has already won a number of massive infrastructure and natural resources projects in the country. Its first penetration to the country was made after it successfully acquired 60% share of the Zara gold project from Chalice Gold Mines (ASX: CHN; TSX: CXN) at a whooping price of US$114 million last year. The Eritrean government through the Eritrean National Mining Corporation (ENAMCO) owns the remaining 40%. 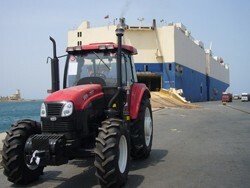 Soon after, it won the “Eritrea Equipment Procurement Logistic Contract” from the Eritrean government worth $161.54 million and successfully deliver the thousands of machinery and equipment in two phases that include dozens of excavators, motor graders, rollers, loaders, cranes, pumps, tractors, buses and some other construction and agricultural equipment. The second batch of shipment that was made in mid-May alone constitutes 415 units of construction machinery and vehicles, and 687 boxes of spare parts, mainly for tractors, trailers, excavators, bulldozers, road maintenance truck, passenger buses, trucks and drilling motors. It also won another multi-million dollar Engineering, Procurement and Construction (EPC) contract for the Hirgigo Power Plant Extension project that is near completion to streamline the electric supply in the country. The cordial business relation between the state of Eritrea and China SFECO Group started three years ago after Mr. Tong Jisheng, Vice-President of Shanghai Construction Group and the President of SFECO accepted President Afwerki’s invitation to made a state visit to Eritrea. Still our motto is " niked terah" thanks to our martyrs who clean the road for us. Why do you keep buying thousands of brand-spanking new tractors and earth moving equipments when you can buy used ones from India that are only 10 years old and probably cost a lot cheaper than the new ones? That's what weyane would do if they weren't so busy buying used fighter planes from a junkyard in Russia. I was only trying to give you some good tips to help you save a lot of money. For example, I heard you built hundreds of small to medium-sized dams throughout Eritrea for irrigation and clean drinking water purposes. It probably would've been cheaper if you were to build just one big dam (renaissance dam) to generate electricity for export to your neighboring countries. That way you can show your neighbors how much you care about their basic needs. Stop isolating yourself from your neighbors by focusing only on your own immediate needs. We live in a world of globalization. And globalization means putting the interests of other countries before your own country's interests. I hope you put my valuable tips to good use. You have good intentions but Eritrea's isolation is caused mainly by the Ethiopian government's refusal to accept the border ruling and its alliance with the US. We want to see a prosperous Ethiopia, and we know that it will be our most important trade partner in the future. Ethiopia's population is prospected to grow above 173 million by the year 2050. The Eritrean government has chosen a different path than Ethiopia, we want sustainable development and build up from the bottom. That means education, healthcare and prosperity to the lowest ends of the society first. We wish to see an integrated market between the greater horn of Africa countries and furthermore strengthen the AU to realize the dream of Nkrumah and the founding fathers. Ethiopia must realize that it's interests are best met together with its neighbours, not by siding with the Imperialist who will discard you as soon as they get what they want. Do you guys understand the meaning of "sarcasm"?? Arba Gorash is not criticizing!! What you said about development… however, is 100% accurate. And eloquently stated. I salute the people and government of Eritrea for everything. Hi tesfanews, if you can tell us about hirgigos EPC contract and the capacity it will gererate after the compeletion,and also if will it be enough for the whole country?thx and God bless u.